Once again alarming reports have come out of Dagestan, the largest republic in the North Caucasus. This time, a suicide bomber rammed a car loaded with explosives into the gate of the military unit of the 136th Motor Rifle Brigade, which is deployed in Buinaksk. In this Dagestani town, 41 km away from the capital Makhachkala, terrorist attacks and acts of sabotage happen all too often. However, the latest incident is especially prominent in the chain of tragic events in Dagestan. The target of the suicide bomber was the military unit of the Guards Motor Rifle Brigade, which makes up the 58th Army. This army was formed in 1995 especially for action in the Greater Caucasus. 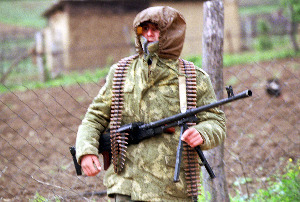 It participated in two Chechen campaigns, in operations in other North Caucasus republics and also in the five-day war with Georgia. Today it is Russia’s main strike force in the country’s most volatile region, a region that also has an unstable border with Georgia. The recent incident in Buinaksk has put this area back in the spotlight. Although Dagestan is once again in the headlines, there remains little understanding of the threat posed by the largest North Caucasus republic. Dagestan shares borders with Georgia and Azerbaijan, and Makhachkala is one of Russia’s few year-round ice-free ports, so the republic is of vital importance for Russian national security. Nevertheless, this latest terrorist attack is only being examined in the immediate context; the discussion is about the possible culprits and versions of events while the socio-political environment in which the crime took place remains in the background. However, the executors of the crime are products of the internal situation. Dagestan is regularly subject to media interest in conjunction with “political murders”, acts of terrorism, sabotage or counter-terrorism, but in contrast with neighboring Chechnya, all these events are recorded without being analyzed. The Russian government at least attempted to interpret the “Chechen crisis” and place it in a certain context, the recent occurrences in Dagestan are not getting any systematic evaluation at all. There is a lot of talk about the Dagestan’s ethnic diversity and the conflicts that result from it. However, the Republic’s problems and conflicts cannot be explained by this alone. In the 1990s ethnic discord was the main challenge to Dagestan’s unity. It resulted in conflict and acts of violence, including terrorism, but the ethnic elite themselves and the government of the Republic have managed to prevent Dagestan becoming a second Chechnya. Additionally, “blood ties” do not always play a crucial role in Dagestan; loyalty to the republic often means a lot more. Finally there is another important factor that has increased in significance since the mid-1990s—the Islamic revival. Those who now adhere to “revitalized Islam” (the local Salafi version that is sometimes referred to incorrectly as Wahhabism), come from different ethnic groups. Salafi Muslims have become popular because they have stuck to slogans advocating social justice and a struggle against corruption. They offer a new alternative to a society disillusioned with the Soviet regime and the democracy of the 1990s. But this does not fully explain the problems in the region. After the collapse of the Soviet Union, many people moved from Dagestan to other parts of Russia. Many of them managed to build successful careers, to get good educations, run businesses, earn money and make a living as civil servants, intellectuals and businessmen. Now some of them would like to give something back, to return to Dagestan and use their material and moral capital for its benefit. After years living away from their small homeland, many of them consider their identity as a citizen of Dagestan no less important than their ethnic origins. And yet another “boundary” has arisen – the Russian Dagestanis of various nationalities are at odds with the Republic’s multiethnic bureaucracy. These “internal Dagestani emigrants” are working independently on opening up the republic; at the same time, their ambitions clash with every level of Dagestan’s governmental elite. In contrast with Chechnya, it is much more difficult to gauge dissident activity in Dagestan; dissidence is multifaceted. It may take the form of an ethnic or religious protest, or it may be found in business or in government. Therefore, Dagestan requires a much more diversified policy. There are many cases of bombings and acts of violence, but there is an individual story behind every one of these; each has its own reasons and motivations. In one incident, the stimulus might be the “privatisation” of government and personal property by “foreigners.” In another, it could be the actions of Islamic extremists. But then these Islamic extremists are not nearly as united as the propagandists would have us believe. They do indeed include people whose motivations are purely religious, but there are also those who are the victims of corruption and a tyrannical government. Due to the lack of public procedures and institutional norms, in Dagestan, a republic burdened with conflict on many levels, people resort to violence as a means of solving volatile issues. In this sense the motivation and legitimation of this violence is not the central issue. Dagestan’s biggest challenge today is in many ways identical to that of the whole of the North Caucasus—implementing the modernization process where the task of preservation is being replaced by the task of development. It is this strategic task (and not only anti-terrorism measures) that should take priority. Even the most brilliantly executed annihilation of militants cannot offset the fact that Dagestan lacks the mechanisms to allow worthy people from poor families to get a good education and a position in government or business. According to Kisriev, “talented young people do not have the opportunity to develop themselves here and to get a good job, this especially applies to people with a keen sense of their own dignity, which they demand of themselves and others.” So it is the frustrated youth who are being recruited as Dagestani jihadists. Consequently, it is essential we stop putting out fires and instead prevent them from ever starting. If this doesn’t happen, then any volatile issue is going to be resolved with gunshots or blackmail. And it will be extremely difficult for Dagestan to resolve this problem on its own, without the help of the central government. Sergei Markedonov is a Visiting Fellow at the Russia and Eurasia program of the Center for Strategic and International Studies (CSIS) in Washington, DC.